"Be young. Be free. Be somebody." 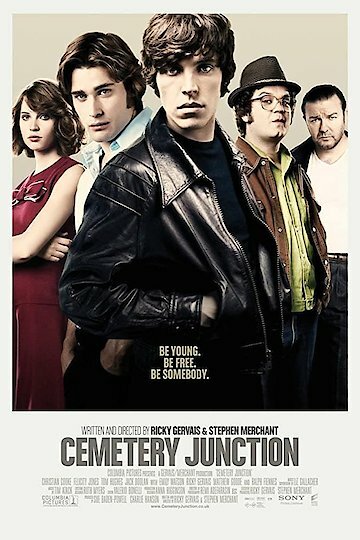 Set in the 1970s, Cemetery Junction tells the story of three male friends who focus their lives on chasing women and drinking. Professional success is generally not on the proverbial to-do list. Eventually, one of fellows in the trio decides he wants to leave their working class town and improve his life. He takes a job selling insurance door-to-door for the father of his high school sweetheart. This change forces the other two men to reevaluate their lives and consider taking different paths of their own, even though they both generally have been more than happy with the state of their own affairs. Cemetery Junction is currently available to watch free on Crackle and stream, download, buy on demand at Vudu, Google Play, FandangoNow, iTunes, YouTube VOD online.